I was on assignment last night at County Barbecue, and so we ordered a bunch of stuff and spent most of the night chatting with the very amiable Eric Williams. Williams is going for pan-regional Q and one of more unusual items we had was a smoked veal brisket. There’s also beef brisket, of course, which we liked quite a lot, but it was interesting to see what could be done with this much less commonly used BBQ protein. WILLIAMS: Go ahead. You can tell me. ME: Compared to the regular brisket, it’s not quite as tasty. WILLIAMS: You’re right. But people want choices. They don’t want to hear that beef brisket is fatty…. WILLIAMS: Right, and the veal is not so fatty, so it’s a good entry point for people. Though not “so fatty,” the veal is nonetheless more fatty than I thought it would be, and with some rub it’s tasty enough, though I definitely prefer “regular” brisket (though the burnt ends were, far and away, my favorite bite of last night as they were the first time I ate at County a few weeks ago). County Barbecue is in the old Gennaro’s space. Gennaro’s was in Little Italy; County Barbecue is in University Village. Ate at County today for lunch - enjoyed most of what we tried. Spare Ribs - as long as you know the difference between spare ribs and baby back ribs, these should not surprise you. They were OK with a decent amount of smoke, but nothing earth shattering. Burnt Ends (brisket) - the fattier pieces of this were amazing and quite similar to what you'd find in Kansas City. The meatier pieces I thought lost a lot of flavor and were better used as vessels for getting sauce to your mouth. Bacon slice - was hoping for a thicker slice, but this is simply a thin crispy piece of bacon brushed with maple syrup. Delicious, yes, but not worth the $3 asking price. Bacon deviled eggs - a decent rendition of deviled eggs, but a smattering of crumbled bacon doesn't change a normal deviled egg to a "bacon deviled egg"
Sauces - I actually wasn't really a fan of any of the sauces. While touted as "vinegar-based" none of these were like a Carolina vinegar based sauce - way too thick, and an odd flavor (I think from chipotle?). Sauces could use some work. That said, the spicy sauce mixed with the corn pudding just did something for me. Corn pudding - The corn pudding is quite good and satisfying, although very similar to what you might get at a family get together for Thanksgiving/Christmas. That said, I'd order this again and again. Cauliflower - very good. Blackened less than you might expect, which I consider a good thing. Nutty and meaty, very satisfying. Rye Smile cocktail - the ginger came over a bit strong on the first sip, but by the end of the cocktail was digging it. Old fashioned (with Templeton Rye) - this was not a very good old fashioned. I'll leave it at that. I loved the vibe of the place. It's small, they play blues, and they have the rodeo on the 2 TVs. Just a cozy spot to have a couple drinks and eat some good food. Wish there were more of these in the city. Service was very friendly and attentive, only adding to the positive vibe I got from the place. I'd absolutely return and would recommend it to anybody. Did they mention what kind of smoker/wood they're cooking on? wahpahh wrote: Did they mention what kind of smoker/wood they're cooking on? The wood is pretty much hickory exclusively. On their Facebook page County claims "The Ole Hickory smoker is the first above the Mason Dixon line"
I suppose it's possible that the model they have is unique, but it is certainly not the first Ole Hickory smoker up north, much less in Chicago. Very disappointing visit to County Barbecue. Nice space, nice cocktails, friendly and efficient service. But I tried the spare ribs and the brisket and both were just really, really dry. I wanted to rescue them with the sauce, but the house sauce, which is tomato based and heavily seasoned with anise and cinnamon was not my cup of tea. I did enjoy the spicy sauce but it wasn't enough to salvage the dry meat. I don't think I've ever been served a smoked brisket with as little moisture as these slices of beef. I'm not sure what to say that the pictures don't show pretty clearly. I had high hopes for the food here but can't imagine going back until I hear from a a consensus of folks I trust that tell me it's worth another visit. I had their ribs at the Hideout Block Party - just "meh" (not very tender, not much taste from the rub). However, I realize that this is probably an unrepresentative sample of their product. I'll need to try their barbecue in the restaurant itself. i have been 2 time s now . but on whole was above avg. Really liked our small takeout order. Veal Brisket: contrary to the above discussion, it was fatty, juicy and very tasty. Maybe we just got lucky. Rib Tips: Nice smokey flavor. Corn Pudding: a bit too sweet for me, but my wife really liked it. I had lunch at County Barbecue today, and I thought it was thoroughly outstanding. I had "A Taste of County BBQ", a combo platter on the menu featuring four of their meats, and all four were excellent. 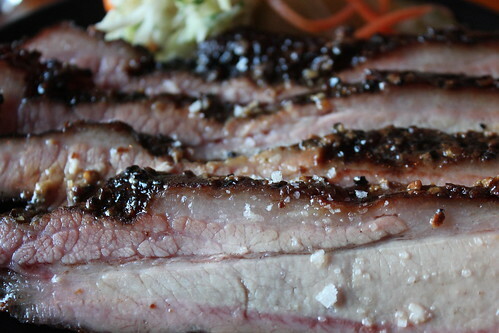 The brisket was one of the tastiest, most tender, moistest barbecue briskets I've ever had. (Whatever caused earlier reports of dry brisket seems to have been fixed.) The spare ribs were great - very tasty, featuring a dry rub but the ribs were plenty meaty and moist. The hot link was very spicy and I liked it (including with their server-recommended mustard sauce on it), although this was my first ever hot link so I don't have anything to compare it with. I also liked the barbecue chicken a lot - very moist, 1/4 (I think) chicken, lots of smoky barbecue flavor. I also ordered the corn pudding, and I thought this was delicious as well. Corn puddings tend towards two styles: "custardy" and "bready", and this was the latter. A couple of caveats. County is a rather small place, and while there wasn't any wait at lunchtime today, it was rainy and I could see how a wait is possible on a nicer day. (EDIT - However I see on their website that they have an outdoor patio, so on a nicer day they also presumably have more seating.) Also, be prepared for the entire dining room to smell like smoke from the smoker - not an unpleasant smell (for me, anyway), but just so you know. I'll be back. And sooner rather than later. County Barbeque will be closed for "several weeks" after a Wednesday night fire tore through the building that houses the Little Italy restaurant. Anybody know what's going on with them? It's been quite a while since the fire, but it appears from their website that they're still closed. David Hammond wrote: County Barbecue is in the old Gennaro’s space. Gennaro’s was in Little Italy; County Barbecue is in University Village. nsxtasy wrote: Anybody know what's going on with them? It's been quite a while since the fire, but it appears from their website that they're still closed. This is 3rd hand (I know people who know people) so take it with ginormous salt crystals. Last I heard was that they intend to be open by summer . . . but latest rumor is without the bar. Since the pretty good and reasonably priced whiskey list, cool bar vibe with decent draft selection, and draft cocktails were one of the appeals for me here this is hard to wrap my head around. I have friends that live in the neighborhood and ate here multiple times per week and I was good for at least every other week - almost always sat at the bar. The first time I went here was with friends and I had set my expectations quite low. I was wrong - the BBQ was good as were the sides (great greens!). Now that they've been closed for so long my friends and I find ourselves longing for being able to head over to County on a Sunday for good food and drinks. I miss the pork puppies! That's some serious bar-snackin'! I wonder if that is due to the campus close by? I would hope you could have people eat in there if they were underaged as long as it's got the right kind of license. They're now planning to re-open this coming August, according to this article about MK closing. County Barbecue, a Taylor Street restaurant that's been closed since a fire last August, plans to reopen in September, its owner said this week. What's going on with this place, will it ever re-open? It's a little bizarre. We want to express how sorry we are for the ongoing delays of the re-opening of County BBQ. What we thought was a simple rebuild has turned into a seemingly never-ending series of hurdles and unforeseen challenges. From construction delays to issues with the City, we have seen every twist and turn an opening has to offer. Ugh! The good news is that when the property’s restoration is done, we’re going to have a brand new home to resume smoking our favorite meats. Please know that we are pushing as hard as we can to get our beloved restaurant re-opened and, when we have an official date, you will be the first to know. Thank you for all of your concern and ongoing support. DMK Restaurants now plans to reopen County in December at 1352 W. Taylor Street.